BEACHY KEEN COASTAL CHIC For local furniture designer, manufacturer and interior designer Kristin Drohan , the need for her new Beach House Collection (kristindrohancollection.com) was one, as many great ideas are, borne out of necessit y. “We were doing a lot of stu on 30A and down in South Wa lton Beach,” the Roswell-based Drohan says, “and we had clients and retail stores down there. 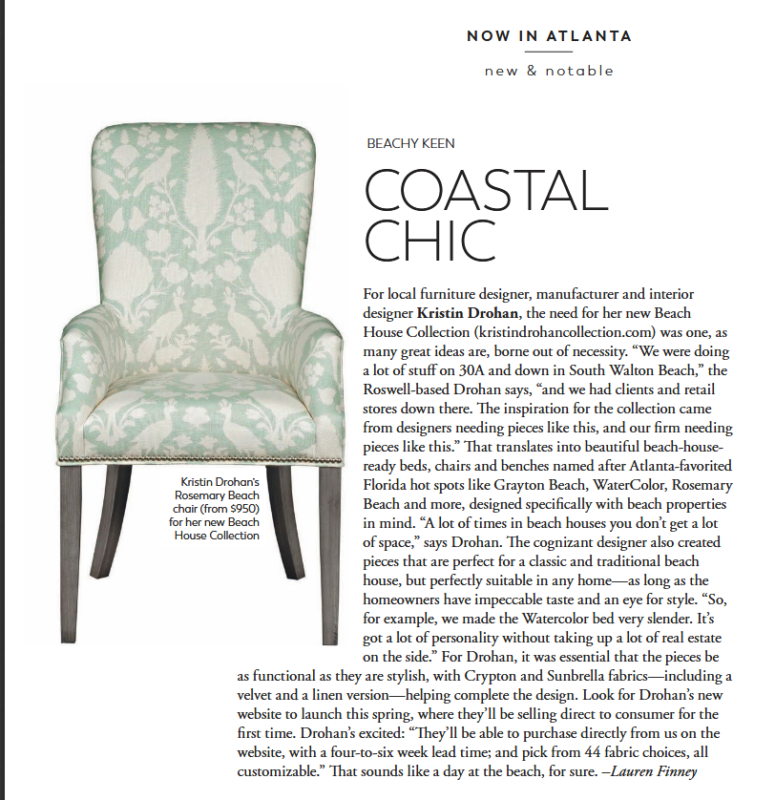 The inspiration for the collection came from designers needing pieces like this, and our from needing pieces like this.” That translates into beautiful beach-house- ready beds, chairs and benches named after Atlanta-favorited Florida hot spots like Grayton Beach, WaterColor, Rosemary Beach and more, designed specifically with beach properties in mind. “A lot of times in beach houses you don’t get a lot of space,” says Drohan. The cognizant designer also created pieces that are perfect for a classic and traditional beach house, but perfectly suitable in any home—as long as the homeowners have impeccable taste and an eye for style. “So, for example, we made the Watercolor bed very slender. 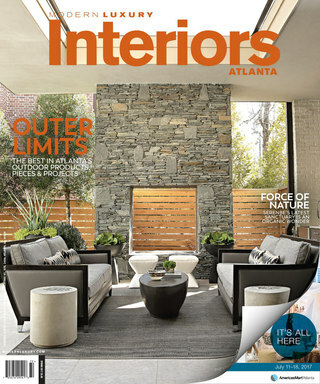 It’s got a lot of personality without taking up a lot of real estate on the side.” For Drohan, it was essential that the pieces be as functional as they are stylish, with Crypton and Sunbrella fabrics—including a velvet and a linen version—helping complete the design. Look for Drohan’s new website to launch this spring, where they’ll be selling direct to consumer for the Frst time. Drohan’s excited: “They’ll be able to purchase directly from us on the website, with a four-to-six week lead time; and pick from 44 fabric choices, all customizable.” That sounds like a day at the beach, for sure. Top 5 Sofa Styles…What’s your Style?